This post was done in partnership with Wirecutter. When readers choose to buy Wirecutter’s independently chosen editorial picks, Wirecutter and Engadget may earn affiliate commission. Read the full USB microphone guide here. After 75 hours of research, interviews, and making audio professionals and regular humans listen to the same phrases spoken into 25 different USB microphones, we remain convinced that the Yeti by Blue makes your voice sound the best with the least hassle. It makes a wider spectrum of voices sound better than the other microphones we tested, which tend to favor certain tones. Our pick since 2013, the Yeti is solidly built and easier to set up on your desk than most of the competition. It does best at capturing a single voice, but you can use it in a pinch for two-person sessions or even music recording. The mute, gain, and volume controls are easy to manipulate while recording. If you’re an enthusiast, you might be able to get better results by putting time into a different, likely more expensive microphone, and more elaborate equipment (see our USB audio interfaces guide), but the Yeti puts the fewest hurdles between you and an ear-pleasing sound. The Yeti isn’t everybody’s pick for the best-sounding USB microphone, but that’s par for the course when it comes to audio critiques. We sent samples of the same voice reading the same phrase into seven different microphones to four audio experts and five Wirecutter staffers. Four people rated the Yeti the best of all samples, though it was also ranked the worst of them by another. Giving the audio experts’ opinions more weight, and considering the Yeti’s features, build, and history of good reviews, it still came out on top. Perhaps the greatest downsides to the Yeti are its weight and tricky-to-assemble base; it’s best for keeping near your computer, and it’s not backpack-friendly. The Shure MV5 is the opposite. It weighs just over one pound fully assembled, its ball-shaped head can be unscrewed from its small base, and it can plug directly into an iPhone, iPad, or Android device. But what really makes the MV5 worth considering is its sound. When using the “voice” preset, its audio samples received a second-place ranking from all four experts (working blind to each other’s results), and a tie for third place from Wirecutter staffers. If the Yeti is sold out or you want to spend a little less and save some room on your desk, the MV5 is a fine single-voice runner-up to the Yeti, although you’ll have to figure out how to get it at your own personal speaking height. As you gain experience and learn what you like in a recording, you may want to fine-tune your setup. You may start recording with other people or with instruments and picking up gear like boom arms, shock mounts, and power conditioners. You will want to find the perfect mic (or mics) for your voice and whatever other instruments you want to record, and you’ll want a USB audio interface to connect it to your computer. Lauren Dragan, who wrote the first version of this guide and consulted on subsequent updates, has a bachelor’s degree in vocal music performance and audio production from Ithaca College. She has worked in broadcast radio as both on-air talent and producer and is currently a professional voice actor. She writes and consults on audio technology for Sound & Vision and Electronic House and reviews headphones and other audio equipment for The Wirecutter. Kevin Purdy, the author of the most recent version of this guide, co-hosted the podcast In Beta on the 5by5 network for more than 100 episodes, all involving microphones and recording. Before that, he learned a lot about bad recording techniques on an amateur podcast, and was frequently a guest on podcasts on the TWiT and 5by5 networks. Do you need a USB microphone? USB microphones are made for easy, plug-and-play use. They include an internal preamp and analog-to-digital converter that takes the incoming signal (your voice, for example), amplifies it, and converts it to a digital stream, ready to send over a USB cable to your computer or iPad for recording. That all means you don’t need any additional gear to start recording. These microphones are most useful for podcasters, musicians looking to share homemade productions online, YouTube enthusiasts (also known as vloggers), and anyone wanting to do much better recording than their laptop’s built-in microphone will allow without having to spend a lot of time learning how to set up professional microphones, mixers, and interfaces. If you do want to delve more deeply into recording your voice or musical instruments and want more options, we have a guide for that, too. A USB audio interface will offer even better sound quality overall than a USB mic, and pick up more nuances in both vocals and acoustic instruments. We have a two-channel pick that records up to two sources at once, as well as a six-channel option better suited to recording a band. If you already have a microphone or headset that sounds just fine, you might not need to spend between $100 and $150 to get great, convenient sound. But it’s hard to know just how much better your voice could sound until you’ve heard the difference. Luckily, we have audio samples below that let you do just that. A USB mic worth its price should capture the whole range of the human voice—with all its pitches, tones, timbres, quirks, and flaws—and make it sound as good as it can be. Ideally, you could upload your recording without any fine-tuning as a podcast and have it sound good in someone else’s headphones. Because a USB mic exists in the realm between built-in recording and the expandable, expensive world of studio-level microphones, the price point should be in that middle range, too. The same goes for its features: options for those who want to fiddle, but not a half-dozen switches and knobs that require adjustment for every single new recording situation. A crucial feature is a zero-latency headphone jack for hearing exactly what you sound like without any distracting delay. Also important is in-mic gain control, though our portable pick does a notably good job of that automatically. Read on in our pick to see why these are so important. Our original research in this category began in 2013, with reading reviews and compiling lists of contenders. Some USB mics had dozens of favorable editorial reviews, others had no mention at all. Next, we examined reviews at Amazon, Guitar Center, Musician’s Friend, and Sweetwater. We interviewed recording professionals, although many engineers have little to no experience with USB mics, preferring their own fine-tuned studio setups. Lauren interviewed Bill Holmes (Compost Productions, McCoy Productions’s studio in Los Angeles, and The Voiceover Doctor) and Lynnanne Zager, a successful longtime voice actor and instructor. Kevin later interviewed Jason Howell of the This Week in Tech network, veteran podcaster Tom Merritt, and two producers at radio and podcast organizations. 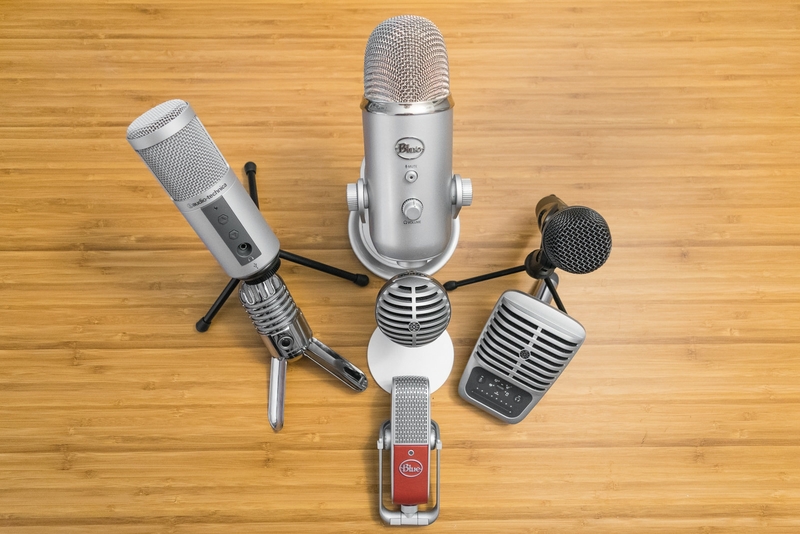 From interviews and narrowed-down lists, we tested the top-rated and most recommended microphones each year for three years. After recording samples and sending them with blind labels, Lauren Dragan and three or four other audio professionals did a blind listening of all the recordings and ranked them from 1 to 10, best to worst. Included in the 2015 and 2016 panels: Brent Butterworth, a well-respected audio reviewer for SoundStage and Home Theater Review and a contributor to The Wirecutter; Phil Metzler, keyboardist and vocalist in the band Just Off Turner; John Higgins, professional pianist, guitarist, and educator in both vocal music and audio production at the prestigious Windward School in Los Angeles; and Geoff Morrison, freelance writer for Forbes, CNET, and Sound & Vision and a Wirecutter editor (working on the 2015 panel only). In 2016, five Wirecutter staffers also rated USB mic samples. After placing these performance results alongside the microphones’ reviews, features, and price, we had our testing set. We tested seven microphones in 2016, including the two previous picks, the Yeti and the Samson Meteor. We ran tests of these microphones with home users and minimal equipment in mind. The sample was a short (20-second) passage read from favorite books of the guide authors. The first recordings (2013) were made in two environments: a professional studio and a home office. The next set of samples (2015) were made in a phone room at the CoworkBuffalo coworking space; the room has some soundproof foam, but it’s inside an open-floor office with workers moving about and typing. In 2016, we recorded both in the small phone room (using an older MacBook Pro) and in a home office (with a Windows desktop). This let our panel hear the difference between open and closed spaces, with very little room (and probably too much sound bounce) and a room with hardwood floors and very few rugs. We used the same mic setups for each microphone (5 inches from mouth to mic surface, no pop filters or shock mounts), and read the same excerpt in each round. In 2015, Kevin recorded the samples in two stages: one with the gain set to a neutral, or “unity,” position, and subsequent recordings with gain adjusted to compensate for signal strength and volume. In 2016, after learning a lot from feedback on the 2015 samples, Kevin recorded each sample with the peak volume landing between -6 and -12 decibels. The samples were so consistent that Wirecutter staffers complained about having to tell the difference, while the audio experts were glad they could hone in on subtle differences. The 2013 and 2015 samples were recorded in GarageBand on a Mac, with no effects or filters, then converted into CD-quality .aiff files. In 2016, the samples were recorded with the free recording software Audacity, on both Windows and Mac, then exported to 32-bit WAV files. All the files were named with just a letter to identify them for surveys. If you want to plug a microphone into your computer or iPad and quickly sound clear and engaging whether recorded or live, we recommend the Yeti by Blue. It provided the most reliably well-rounded, natural sound out of all the mics we tested?whether on Windows or Mac, or whether recording happened in professional studios or in a small square office. It was often the highest-rated in our three different tests, and when it wasn’t, it still ranked among the best. It offers live headphone monitoring and gain control, two key features for any recording setup (other mics lacked these or made using them too complicated). It is more stable on its stand than most microphones we tested, and feels far more solidly constructed and durable. 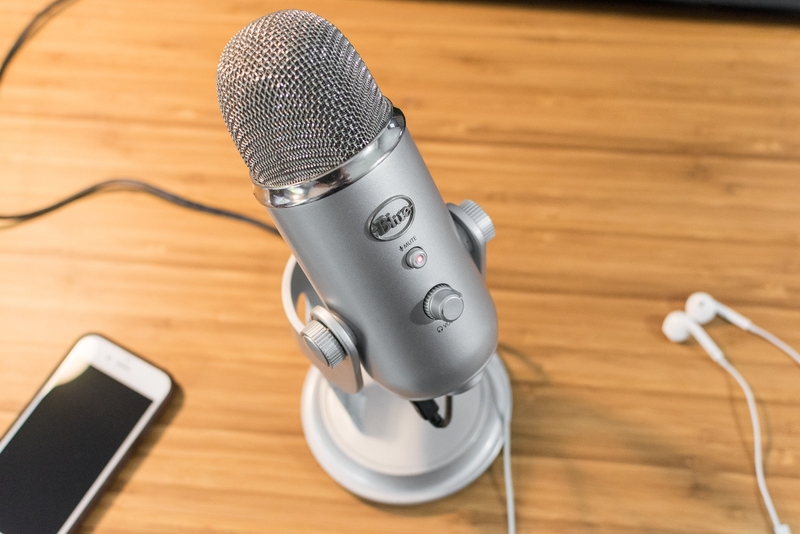 The Yeti costs $20 to $50 more than most desktop-size USB microphones, but many people may not need to spend a dime more to be ready for a podcast, YouTube show, or amateur voice recording once they’ve purchased it. At most, people may want to pay a few bucks for a universal pop filter with the Yeti. Otherwise, you get a setup that, in our experience, sounds much better over a video call, and which audio producers are more than happy to work with. From our experience recording samples with dozens of different USB microphones, we can attest that the Yeti is one of the easiest mics to get plugged in and sounding decent without much knob-twiddling or software-slider-sliding. Compare this with a supposed “professional quality” microphone that cost $100 more, which judges found in 2015 to have a “tinny, compressed sound” that sounded like it had a “mild version of a T-Pain-type AutoTune effect.” Most other mics, whether more expensive or far cheaper, pick up far more mouth noise and sounds (“plosives” and “sibilance”) or significantly alter your voice at certain frequencies to round out the sound (or try to correct shortcomings). The Yeti is less likely to hiss, boom, or enhance male/female voice disparities than other microphones. It’s a sensible USB mic at a reasonable price. There are two features included on the Yeti that we believe are necessary for any mic used for podcasting or recording vocals. First, a zero-latency headphone monitoring jack; nothing is quite as frustrating as thinking you got a fantastic take, only to find out your p’s were popping the entire time. Second, if you want to sing or speak over another track, you want to hear yourself in the mix without any delay. When you plug your headphones into your computer, there is a slight delay (due to the processing used by the analog-to-digital converter as it encodes your voice) that can be really infuriating if you are trying to match a beat or narrate over a video. Some of our first batch of competitors lacked direct headphone monitoring; all but one of our 2015 and 2016 testing models featured headphone jacks. The other feature, a must-have, is in-mic gain control. This enables you to have more control over the volume of what is coming out of the microphone and into your computer. This is helpful if you are switching from a boisterous speaker to a soft-spoken one or from a lullaby to an aria. If you’re recording something live, like a podcast, it’s also far easier to dial down a physical gain dial on the mic just a tad than it is to figure out which software slider you need to click and drag to reduce background noise or prevent clipping. The Yeti has a master volume control, which mimics a headphone monitor control on a professional recording console. Its light-up mute button comes in handy for live recordings (or if you want to listen to playback without mic input). The other side of the Yeti has a dial with firm, reassuring clicks between four pickup patterns: cardioid (one person), stereo (multiple sources from two sides), omni (the whole room), and bidirectional (two people across from each other). A surprising number of microphones we tested made it hard, or just hard to see, what pickup mode you were using, and what features and inputs you had enabled. The Yeti comes with its own swiveling table stand, but you can remove it and place the mic on a traditional mic stand—but not all mic stands, and not without a little hassle. More on that in Flaws but not dealbreakers. Why is $130 a good price for the Yeti? Go more than $20 below this price, and you’re almost certainly losing at least one feature, usually gain control. To get a better USB-connecting microphone than the Yeti, you’d need to spend $70 to $120 more or switch to a prosumer or professional mic with an analog XLR output, and add in a USB interface to get your voice onto the computer. At its price, and seemingly always in stock, the Yeti is the perfect microphone for keeping handy or taking one’s first steps into semi-pro recording. 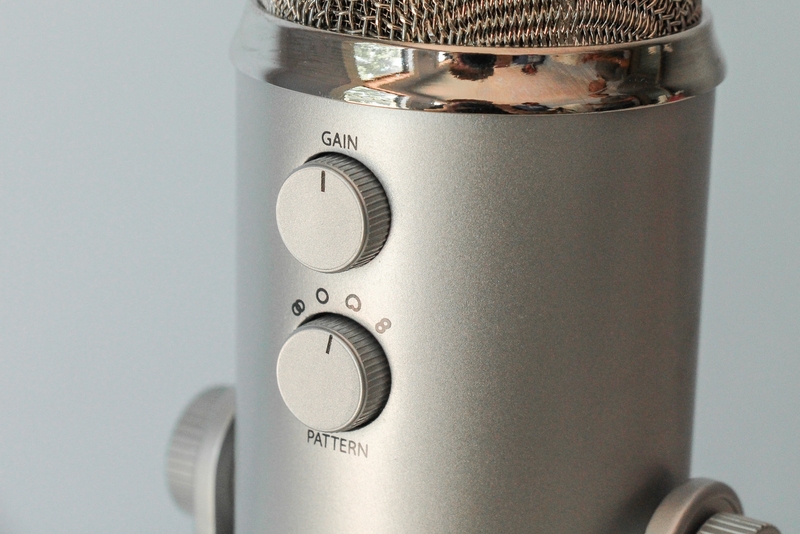 The Yeti gets much love from reviewers, owners, and experienced broadcasters and podcasters. And the release of a smaller Blue microphone, the Raspberry (also reviewed in 2016), has reminded critics of how much they like the original. Jason Howell, a producer at podcast network TWiT, recommends the Yeti as an “excellent all-in-one microphone for the price.” Tom Merritt, host of the Daily Tech News Show and Sword and Laser podcasts, leans toward XLR-to-USB converters, but notes that his wife, a podcast veteran and YouTube producer, “uses and loves” a Blue Yeti. Two different producers at a major broadcast organization, who could not provide direct quotes or attribution due to journalistic and licensing issues, recommended a Yeti as a very good USB option. Reviews of the Blue Raspberry in late 2016 yielded retrospective praise for the Yeti, too. “One of the most popular (and capable) home mics,” notes Wired. “Dependable recordings with little fuss,” according to Gizmodo. The praise goes on like this. After more than 15 years, the Yeti still has a strong rating on Amazon and at audio gear site Sweetwater. The biggest flaw with the Blue Yeti is not its sound; it’s its build. The default stand is sturdy and heavy (2.2 pounds with the mic attached), providing stability and bump resistance. It’s taller than most mics, but still a bit low?fine for an average-height person recording at a computer desktop, tricky if you’re standing or if you’re a tall person. There are multiple washers, a rubber ring, and some tricky screws keeping the mic inside that stand, and they can easily come loose and scatter if you try to dismount the microphone too hastily. Once out of its stand, the Yeti microphone itself weighs in at 1.2 pounds—too heavy for most standard “shock mounts,” even though it has standard ?-inch threading to work with one. It can also be awkward, and tippy, with small desktop mounts. That’s a recurring irritation mentioned in Amazon reviews. The same goes for pop filters; those that are made for general microphones often do not fit well on the Yeti’s basic stand. A universal clip-on version (like this filter) can do in a pinch, but the look and space taken up by a long wire can be irksome. None of this would be an issue if Blue’s custom Yeti shock mounts did not cost about $50, and its branded pop filter about $40. You can find universal accessories that will work fine with the Yeti, but you have to look into their stability and compatibility with your gear yourself. If you’re new to microphones and audio gear, you very well may speak into the Yeti the wrong way your first few times. The Yeti is a side-address microphone, meaning the mic should be positioned so the side of the microphone with the volume and mute buttons faces you. The Yeti’s curved, swiveling-stand design, however, can lead you to believe you should speak into the end of the mic, as you would with more a common end-address mic. But this is a mistake that listeners will definitely be able to hear. Lauren used the Yeti for more than nine months after her 2013 tests without experiencing any problems. Kevin Purdy has used a Blue Yeti since 2012, has no complaints, and has received none from podcast editors he’s worked with. 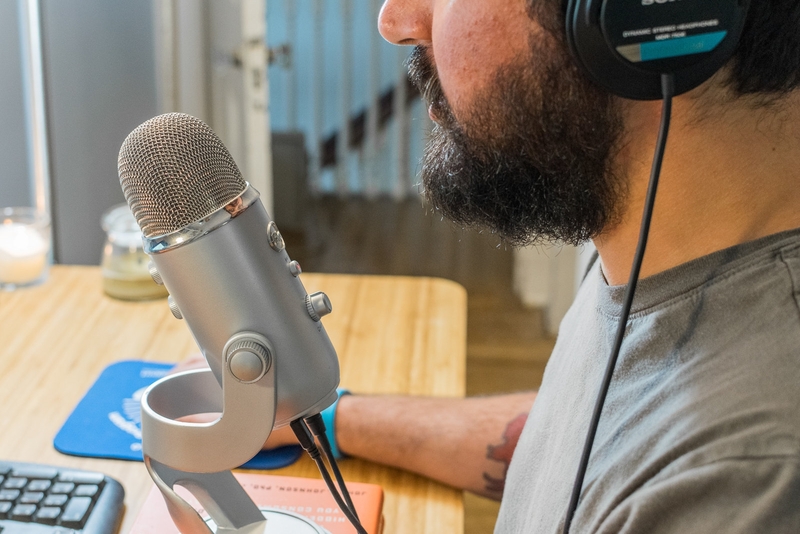 A reader reported to us a few months after posting our pick that the Blue-branded pop filter was getting poor reviews on Amazon because it wasn’t threading properly on the Yeti and had to be jury-rigged to make it stay put. We contacted Blue, who told us they were aware of the issue and it already had been corrected. Blue offers replacements for those who purchased an (older) Yeti with this issue; be sure to contact the company if you have concerns about yours. Two Wirecutter staffers and a handful of reviewers at retail sites noted that they found the USB port on their Yeti to be “loose.” One Wirecutter staffer had a USB cord rip out the port when he turned the mic too quickly in its stand. A Blue representative told us that this issue is covered under warranty, with repairs or replacements available. If desk or storage space is at a premium, if you often move your mic between spaces, or if you want to save a few dollars and start small, the Shure MV5 scored well with our panelists in voice recording quality—some even ranked it better overall than the Yeti. The tradeoff is that the MV5 is not as sturdy, stable, or as tall as the Yeti, making you work to set it up at the proper height for recording. And it lacks for the Yeti’s multiple pickup patterns. But the MV5 has just enough recording features—a direct-monitoring headphone jack and impressive automatic gain control, and really helpful travel tools, including micro-USB and MFi-certified Lightning connections—to make it a solid pick for people who value a smaller size and portability over future-friendly capabilities. All four of the experts who rated our recordings put the MV5 in second place. Most of the other microphones we tested had a much wider range of scores from experts, but the experts all thought the MV5, used with its “voice”/speaking preset, was nearly the best they heard. In other words, the experts agree on nothing else, except that the MV5 can make your voice sound good. Wirecutter staffers gave the MV5 an overall third place, with a wider range of ratings. Kevin’s voice was “very natural and perfectly balanced,” one expert said. While the voice sounded slightly thinner than other mics, it was “the most clear,” wrote one staffer. The MV5 has just enough features that it avoids the compromises you’d expect in a portable microphone. A physical mute button is easy to reach on the back of the mic, as are a headphone jack and slightly recessed volume knob. The “vocal” Digital Signal Processor (DSP) preset created a noticeably more clear reading, without any editing, than flat/neutral, while neutral would allow editing software more leeway in improving your voice. Shure provides an iOS app that allows for quick recording and sharing, with gain control, clip trimming, a live visual monitor, and more presets for equalizing your recordings. With the included micro USB and micro-USB-to-Lightning cables, you can record to pretty much any device you can find. The MV5 weighs 5.6 ounces with its stand (the mic head is 3.2 ounces on its own), and very easily disassembles into a ball-shaped head and a C-shaped stand. The Yeti weighs 2.2 pounds with its stand, or 1.2 pounds on its own, six times as much as the MV5. 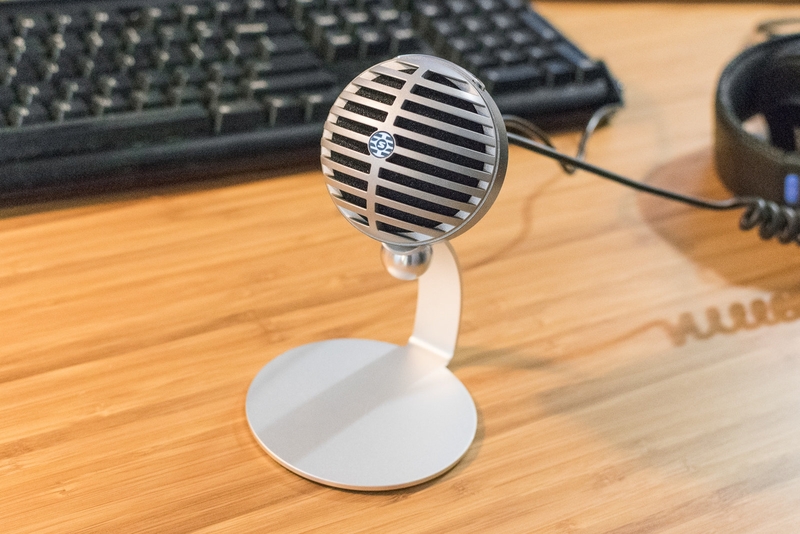 A heavy mic in a metal stand is useful when it sits on a standard work desk, near a keyboard, because it transmits less motion to the recording. But the MV5 is far easier to stash after use, and it’s much more suitable to toss in a bag. The MV5 head’s light weight also lets it work with most desktop microphone stands without any tipping issues. The mic head has a ¼-inch thread, standard for camera tripods, but it also comes with an adapter to allow it to screw into more typical ?-inch microphone mounts. Besides the trade-off of stability and portability, the MV5 is not without its flaws. Depending on your height and seating, the lights indicating the MV5’s mode and muting on the top-rear of the mic can be hard to see. We encountered a couple “oh, wait” moments while testing the MV5 because we couldn’t see the small blinking red lights. Five of the nine people who rated our voice samples said they noticed far more plosives (vocal pops) with the MV5, including three of our four audio experts. This could be corrected with an external pop filter, or perhaps by testing farther-out mouth positioning, but it’s present when recording close to the mic. Finally, because the MV5 is a small mic, with a small default stand, unless they invest in another desktop stand, some people are going to have to put the MV5 on top of something (preferably something stable), or drastically lower their chairs, to get the mic into a comfortable speaking position while at a laptop or desktop computer. This is the case, too, with the Yeti, depending on your height and chair, and it may be only an occasional inconvenience. But it only took a couple relatively thin books to get the Yeti to a comfortable height with our 5-foot 10-inch tester, while the MV5 required 8 books of varying size. You can easily find a desktop mic stand to mount the MV5, but that also breaks up the Shure’s retro look (if that’s what attracted you to it), and if you’re interested in the the MV5 for traveling given it’s small size, carrying a stand makes the overall package less portable. You’ll need to figure out your own tolerances for height, looks, and convenience. The Samson Meteor was our prior pick for a decent-enough portable USB microphone, but after we used and heard the MV5 and saw our panel’s feedback, the Meteor quickly fell. Experts ranked it last in 2016, and staffers found it to be mediocre. The sizable grill causes bounce-back that makes it sound unnatural, and both experts and staffers noticed a lot of mouth noise. Blue, the maker of our Yeti pick, released a portable-minded Blue Raspberry in the fall of 2016. It sounds great, ranking second among our experts. It folds up into the size of two stacked candy bars, and it has a headphone jack, gain control, an intelligent level/clipping light, and direct iOS/Lightning recording. The main issue is that it costs significantly more than the Yeti and more than twice the price of the MV5, even though the MV5 sounded better to both experts and our staffers. And the mute function requires pressing in the mic volume dial, which almost always needs to be done delicately and always moved the mic on our desk. Shure’s MV51 comes from the same MOTIV family of Shure portable products as our MV5 portable pick. It has a larger diaphragm for capturing sound, more processing modes, and touch-bar buttons for input level and muting the mic or headphones. It’s a bit heavy to be portable, a bit small for the desktop, and didn’t sound better to either set of panelists than the MV5. It may be better at capturing instruments or recordings in a larger room, but at nearly twice the price of the MV5, you’d be better off moving to a more semi-pro setup with a separate XLR mic and audio interface. On the recommendation of commenters and the strength of reviews, we tested two Audio-Technica microphones in 2016, the condenser ATR2500-USB and the dynamic USB/XLR hybrid AT2005USB. We had avoided testing dynamic mics for home vocal use because condenser mics in general have a more nuanced voice capture (to cut a very detailed discussion quite short). Even when we thought we had the levels on the AT2005USB just right, we ended up with vocal samples that were rated last and near-last by staffers and experts, respectively. The ATR2500-USB didn’t fare much better with our experts, ranking just above the AT2005USB. Otherwise, it’s a serviceable microphone at a lower price than the Yeti; if you like its sound better, you might want to try it out. We tried to test a Samson Stage X1U wireless microphone but encountered difficulties on both the Windows desktop and Mac laptop. On Windows, the mic and its wireless USB adaptor paired with ease, but setting a level that matched the other microphones required numerous adjustments to the mic’s gain—using a screwdriver inside the battery case. When trying to pair the mic with a MacBook Pro, it took five tries before we gave up on the microphone connecting. It’s not a convenient mic for anyone to grab and start talking into. The Rode NT-USB USB Condenser Microphone, a newer version of a microphone Lauren tested in 2013, came the closest to unseating the Blue Yeti in our 2015 tests. Its sound quality, averaged across two rounds of testing, was nearly tied with the Yeti, just ever-so-narrowly edged out by the Yeti’s more neutral sound. But the Yeti was a bit simpler to set up and has a long reputation behind it. That said, the Rode is by no means a bad purchase; it just costs a bit more than we’d hope to pay. Another Samson, the C01U Pro, produced the an echoey, unpleasant sample in our 2015 tests. It also had notable issues with popping and was missing a lot of lower-end sound. The Razer Seiren Elite Pro had all of the features of the Yeti and far more interesting looks. Its multi-purpose LCD display isn’t as useful as notches on a physical dial, because you have to stop and look at it to adjust. As for audio quality, it sounded “boxy” and “thin” to our panelists in 2015, seemingly focused too narrowly on up-close vocals. The Apogee MiC 96k, a higher-resolution version of the Apogee MiC tested in 2013, did not impress our 2015 panelists, who cited “harsh sibilance and clicks,” “tinny compressed sound,” and “too much upper mids” along with the previously cited “T-Pain-type AutoTune” and “nasal honk” asides. As with the previous MiC, you are paying for a tiny form factor, portability, and some advanced iPad connection and software ability. If you are recording mobile sources frequently, you should upgrade to an XLR setup. The 2013 panel liked the sound of the MXL USB.009, but some found the sibilance a bit too harsh. The build quality of the chassis also seemed cheap for the price. The Yeti Pro is nearly the same microphone as the Yeti: same capsule, same features, same chassis (but black). So why does it cost nearly $100 more? Two things: XLR analog output and a higher sampling rate (the Yeti has 48 kHz/16 bit while the Yeti Pro offers 192 kHz/24 bit). We feel most people looking for a USB microphone won’t need/want the XLR output nor the extra sampling rate that is not able to be represented on CD, mp3s, streaming, etc. The MXL Studio 24 was similar in sound to the MXL USB.009 but lacked depth when compared with its more expensive sister mic in 2013. The only on-mic control is a gain knob and headphone jack, with no master volume control. One panelist liked the sound of the Audio Technica AT2020 (the XLR-only version of the ATR2020USB+), but the rest of the 2013 panel found it to be merely okay. For the same price as our main pick, the AT2020 lacks gain control and a headphone jack. That’s enough to make us pass on it. The Blue Nessie has the same capsule as the Yeti, but many on our 2013 panel found the sound to be lacking, likely due to the lack of gain control. It has a built-in EQ settings switch, a shock mount, and a stand. But that stand is permanent, making the Nessie even less adaptable than the already-heavy and not-quite-flexible Yeti. The MXL Tempo is inexpensive, and it has a headphone jack, but no gain control. Our 2013 panel didn’t love the sound, finding it “flat.” We think the features and better sound quality are worth the extra money for our top choice. In 2015, Gibson launched a new microphone brand called Neat, which we’ve yet to test out. While the company’s first two mics in its Bee line use analog XLR connections, not USB, the Neat Bumblebee and Neat Beecaster are desktop mics that fit in this category. However, even the less expensive Bumblebee is about twice the price of our pick, so we can’t recommend either Neat Bee product right now. Neat has a second line of mics, the Widgets, which are more competitive with the Blue Yeti on price. But they don’t have what we think are two of the most important features, a headphone monitor jack or gain control. Gibson looks to be selling these mics on whimsical design over functionality, so we won’t be recommending them. We tested the Rode Podcaster USB Dynamic Microphone twice and found vocals either muffled or muddy. This model is light and compact by design, but while it may be ideal for someone with a booming radio voice, we don’t recommend going through extensive hassle to program ideal EQ settings. 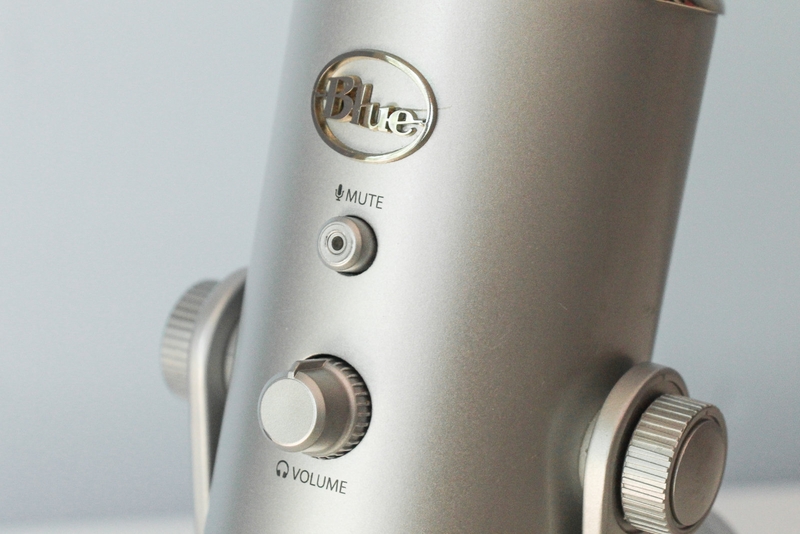 Blue launched a smaller, streamlined version of our top pick Yeti microphone, the Yeti Nano. It’s shorter (8.3 inches tall, versus the full-size Yeti’s 11.6 inch height), lighter (1.39 pounds for the mic and stand, 2 pounds less than the big Yeti), it has two pick-up patterns (one-person cardiod and omnidirectional) instead of four, and it’s available in four colors that all look a bit more modern and sleek than the Yeti’s big silver capsule. There’s also a companion app for Windows and Mac that can update firmware, change settings, and adjust levels. We’re testing the Yeti Nano now, and will include it in the microphones tested for the next update to this guide. Blue was also acquired by Logitech in July 2018. We’ll keep an eye on the quality of its new and old microphone lines, but Logitech’s acquisition of Ultimate Ears and Jaybird set the precedent that we have nothing to worry about. We plan to test the AmazonBasics desktop mini condenser microphone. It’s 9.2 inches tall, weighs just 9.6 ounces, and it’s affordable at less than half the price of our top pick. It’s available in black, silver, and white. Samsung announced the Q2U Recording and Podcasting Pack. The bundle includes a Q2U dynamic microphone (with USB and XLR connectivity), a desktop stand, and mic clip. It also comes with a mini-USB–to–USB cable and XLR cable, so you can plug the mic directly into a computer, audio interface, or both simultaneously. It’s available now for around $60, and we’ll check it out soon. The Senal UB-440 Professional microphone has been around for several years, but after opening the floor to more possible picks in fall 2017, we’ve decided to put the UB-440 to the test. It’s priced similarly to our top pick and equipped with some of the same features, such as a cardioid pattern condenser. It has integrated variable and preamp gain, and its monitoring is noted to be latency-free. The sensitive mic is supposed to be ideal for recording voice-overs and instrumentals. We’ll see how its high-pass filter, continuous headphone control, and other features measure up to those of our current recommendations. Announced in July 2016, the Polsen RC-77-U Retro is another large diaphragm condenser microphone with a unique build that we think is worth testing. It isn’t packed with a bunch of technical features, but it is compatible with Mac and Windows, and it has a dual-stage grille that helps with smoothing out vocals. Polsen highlights the microphone as the best for use in creating music or podcasts. It comes with a 3.5 mm headphone connector, headphone volume control features, and an LED status indicator. We’re looking forward to testing its low-latency monitoring and its “clean and natural sound” in a range of environments to determine how much its lower pricing affects quality. It’s available now for about $70. In October 2017, Razer announced the Seiren X microphone. One of its highlighted features is a built-in shock-resistant mount that combats vibrations should the mic or the surface it’s on get an unexpected bump. It also has zero-latency monitoring, a supercardioid pickup pattern, and extended frequency response. It’s designed specifically for live streaming, so we’ll have to test it to see if its simplistic design and the tight-angled recording help performance. It comes with a mute button and a 3.5 mm headphone jack. Priced at about $100, it’s available to order now.